Heat gas or charcoal grill. Cut six 15x12-inch sheets of nonstick foil. (DO NOT USE REGULAR FOIL.) Cut off rounded ends from loaf of bread. Cut loaf crosswise into 12 slices, each about 3/4-inch thick. Spread one side of each slice of bread with rounded teaspoon cream cheese. For each sandwich, top 1 bread slice, cream cheese side up, with half slice of cheese, 1/6 of the turkey, 2 tomato slices, remaining half slice of cheese and second bread slice, cream cheese side down. Place sandwich on 1 foil sheet; wrap securely using double-fold seals, allowing room for heat expansion. When grill is heated, place foil-wrapped sandwiches on gas grill over low heat or on charcoal grill 4 to 6 inches from low coals. Cover grill; cook 10 to 12 minutes or until cheese is melted and sandwiches are thoroughly heated, turning sandwiches over every 2 minutes. To serve, open wrapped sandwiches carefully to allow steam to escape. Plum tomatoes are used in this recipe because of their lower moisture content, which reduces the chance of the bread becoming soggy. 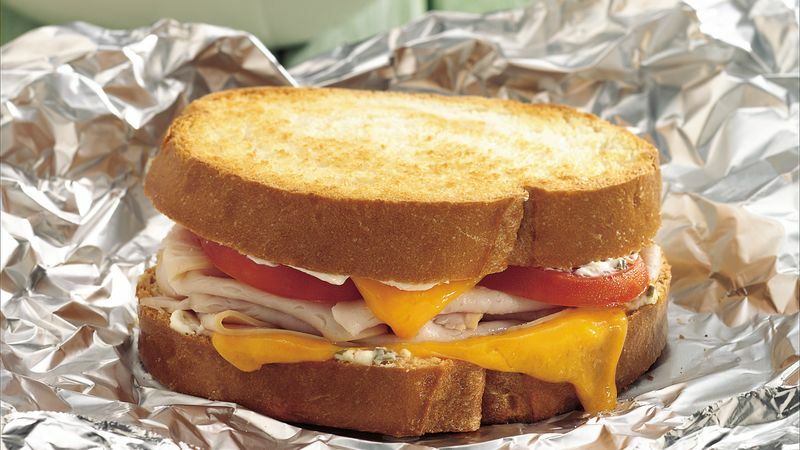 We have called for nonstick foil; any Cheddar cheese that melts out of the sandwich will stick to regular foil. If substituting regular foil, spray the foil with nonstick cooking spray. A mixed green salad is the perfect complement to this grilled sandwich.